Before it filed for bankruptcy earlier this month, Colorado National Bancorp’s financial performance in 2017 was getting better; but the bank was still losing money every year. The Denver-based holding company and its subsidiary Colorado National Bank posted a net loss of $960,000 in the nine months ended Sept. 30, according to internal investor documents obtained by BusinessDen. That compares to a net loss of $1.31 million during the same period in 2016, according to the financial statements. 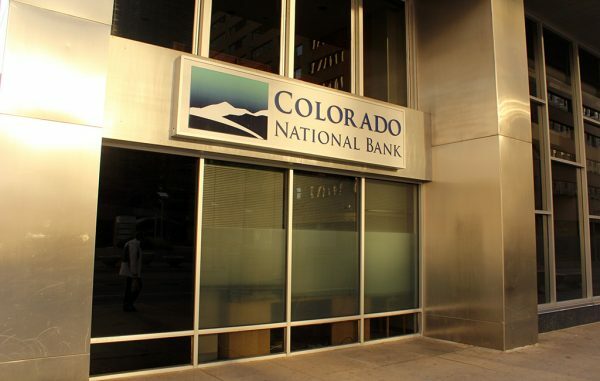 Colorado National Bancorp filed for bankruptcy Nov. 8., with an executive saying the move would allow the sale of Colorado National Bank, which has two branches, in Denver and Palisade. Court filings say Mark Moskvins and Maksims Jarosevskis are seeking to acquire the bank for $5 million in cash, and have agreed to infuse at least $2 million in new capital into the bank. Moskvins and Jorosevskis are owners of SIA Transact Pro, a Latvian payment processing firm. Attorneys representing the pair have not responded to requests for comment. The financial statements indicate Colorado National had just over $3 million in revenue in the first nine months of 2017, with service charges and loan interest and fees accounting for about 65 percent. During the same period, the firm had nearly $4 million in expenses. Salaries and employee benefits were the largest, at $1.55 million, but the company was noticeably leaner than 2016, when it spent $2.47 million in the same period. The second-largest expense was interest on borrowed money, at $671,000, which gets at the root of the current bankruptcy filing. Previous filings state Colorado National leadership – under CEO Scott Jackson – has been trying to sell the company for two years. That’s in part because of $4.7 million of promissory notes the company issued in 2013. The notes were set to mature on Dec. 31, 2015, according to the investor document. Some holders agreed to extend maturity until the end of 2016, but others sued Colorado National in June 2016, resulting in a $4 million judgment in January 2017. Colorado National said, as of Sept. 30, the suit cost the bank $80,400 in legal fees. Colorado National Bank President John Sprengle said the promissory notes were issued to fund a planned strategic growth initiative, which involved the growth of lending operations through SBA loans and trust and custody services. The expectation, Sprengle said, was “that the debt would be converted to equity upon approval of the bank’s strategic business plan,” but the plan was not approved. Colorado National was founded during the recession. CEO Jackson expected a wave of bank failures and told The Denver Post in 2009 he hoped to raise $30 million and strike deals to acquire hundreds of millions of dollars worth of troubled banking assets. The company, then known as Community Bank Partners, reached a deal in 2009 to acquire Palisades National Bank, but made no further acquisitions.